Michael Mabee respectfully submits comments on FERC Docket No. RM17-13-000, Supply Chain Risk Management Reliability Standards. I am a private citizen with expertise on emergency preparedness, specifically on community preparedness for a long-term power outage. My career includes experience as an urban emergency medical technician and paramedic, a suburban police officer, and in the federal civil service. In the U.S. Army, I served in two wartime deployments to Iraq and two humanitarian missions to Guatemala. I retired from the U.S. Army Reserve in 2006 at the rank of Command Sergeant Major (CSM). I was decorated by both the U.S. Army and the federal government for my actions on 9/11/2001 at the World Trade Center in New York City. In sum, I have a great deal of experience – both overseas and in the U.S. – working in worlds where things went wrong. I have studied the vulnerabilities of the U.S. electric grid to a variety of threats. 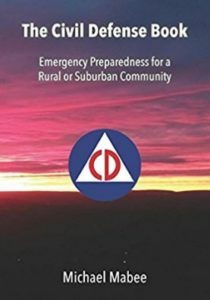 My research lead me to write two books about how communities can prepare for and survive a long term power outage. I continue to write extensively on emergency preparedness for blackout. On March 15, 2018, The U.S. Department of Homeland Security, US-CERT released an alert entitled “Russian Government Cyber Activity Targeting Energy and Other Critical Infrastructure Sectors.” At the same time, it was widely reported in the press that the Trump Administration accused Russia of hacking into the U.S. electric grid. A copy of US-CERT Alert TA18-074A is appended hereto as Exhibit 1 in order to place it in the docket record. The industry through its proxy, NERC, here again is attempting to take a minimalistic approach to grid cybersecurity because to do more would be “burdensome” to NERC’s constituents. Thus FERC is charged with serving the public interest. Not the interests of NERC and/or the electric utility industry. The public interest demands that the federal government insure that the critical infrastructures are adequately protected against known threats. In this case, the cybersecurity of the U.S. bulk power system is not a matter of industry avoiding “burden”; it is a matter of paramount importance for the federal government. In order to serve the public interest, FERC should not rubber-stamp NERC’s proposed rules, but exercise due diligence and carefully consider the public comments, particularly those from outside the regulated industry. Despite years of active attacks on the bulk power system (and its federal regulator) by state sponsored actors, the North American Electric Reliability Corporation (NERC) states that the proposed Reliability Standards should apply only to medium and high impact BES Cyber Systems – essentially making most systems “exempt” from the rules and leaving most of the discretion to apply the rules to the industry. With apologies to Yogi Berra, “it’s déjà vu all over again.” As we saw from docket no. RM18-2-000 (Cyber Security Incident Reporting Reliability Standards), there is a “gap” between what the industry reports as a cybersecurity incident and what common sense would say is a cybersecurity incident. The evidence of the industry’s inability to regulate itself through “best practices” continues to mount. This breach sounds exceedingly bad. North Korea, Iran or Russia having access to PG&E’s systems is a national security concern. What would happen to neighboring parts of the bulk power system if PG&E was suddenly taken down by a cyberattack? Notwithstanding NERC’s lack of transparency in hiding the identity of the “Unidentified Registered Entity,” such a cover-up is against the public interest and should not be allowed by FERC. The PG&E data breach in 2016 and NERC’s cover-up of the identity of the “Unidentified Registered Entity” — who by NERC’s own admission was involved in a dangerous data breach — is ample proof that a watchful regulator is necessary to protect the bulk power system. In fact, there are 172 instances of the word “burden” in industry comments on FERC Docket RM17-13-000. The industry may believe that cybersecurity is a burden, but it is FERC’s job to protect the public by protecting the nation’s critical infrastructure. North Korea, Iran, Russia, China and perhaps others would appreciate the Commission concluding that cybersecurity protection of the bulk power system is too much of an “administrative burden.” These foreign powers might submit comments in support of NERC’s proposals if it were not for the already diligent efforts of the utility industry to avoid appropriate cybersecurity regulation. According to the NOPR, “[t]he NERC Compliance Registry, as of December 2017, identifies approximately 1,250 unique U.S. entities that are subject to mandatory compliance with Reliability Standards.” This is a large number of targets that, if they fail to secure their systems, can provide access to the nation’s critical electric infrastructure. I urge FERC to require NERC to apply cybersecurity standards to all BES cyber systems – including allegedly “low impact” systems. The industry must not have the discretion to determine which cyber systems are easy (and inexpensive) to protect and which are “burdensome” to protect. FERC’s duty here is clear. The Commission must protect electric reliability and by doing so, protect life. The threats to the electric grid constitute a national security issue. This is not a matter of a benevolent government being friendly to businesses. This is a matter of national security and the very real threat to millions of Americans’ lives. Alert (TA18-074A) https://www.us-cert.gov/ncas/alerts/TA18-074A (accessed March 15, 2018). See for example, Gizmodo: “FBI and DHS Warn That Russia Has Been Poking at Our Energy Grid.” https://apple.news/AHv5RwYqbSf-EI-yIa355Jw (accessed March 15, 2018); Washington Free Beacon: “Russia Implicated in Ongoing Hack on U.S. Grid.” https://apple.news/AGs6ieh6wSP-1tQkUFttREA (accessed March 15, 2018); Slate: “What Does It Mean to Hack an Electrical Grid?” https://apple.news/Au5gy7bTlTDSovpvzg5j79w (accessed March 15, 2018); BuzzFeed News: “The Trump Administration Is Accusing Russia Of Trying To Hack The US Power Grid.” https://apple.news/AP5elUw2CQWmAZXgQBXLFKA (accessed March 15, 2018). Bloomberg. “Russians Are Suspects in Nuclear Site Hackings, Sources Say.” July 6, 2017. https://www.bloomberg.com/news/articles/2017-07-07/russians-are-said-to-be-suspects-in-hacks-involving-nuclear-site (accessed March 17, 2018). U.S. Department of Justice. “Nine Iranians Charged With Conducting Massive Cyber Theft Campaign on Behalf of the Islamic Revolutionary Guard Corps.” March 23, 2018. https://www.justice.gov/opa/pr/nine-iranians-charged-conducting-massive-cyber-theft-campaign-behalf-islamic-revolutionary (accessed March 23, 2018). Washington Examiner: “Iranian hackers targeted power grid watchdog, Justice Department says.” March 23, 2018. https://www.washingtonexaminer.com/policy/energy/iranian-hackers-targeted-power-grid-watchdog-justice-department-says (accessed March 23, 2018). Bloomberg. “Threat from Cyber Hackers is Growing, U.S. Grid Regulator Says” https://www.bloomberg.com/news/articles/2018-03-23/threat-from-cyber-hackers-is-growing-u-s-grid-regulator-says (accessed March 24, 2018). Vickery, Chris. “Pacific Gas and Electric Database Exposed.” https://mackeeper.com/blog/post/231-pacific-gas-and-electric-database-exposed (accessed March 23, 2018). NERC “Full Notice of Penalty regarding Unidentified Registered Entity FERC Docket No. NP18-_-000.” February 28, 2018. http://www.nerc.com/pa/comp/CE/Enforcement%20Actions%20DL/Public_CIP_NOC-2569%20Full%20NOP.pdf (accessed march 23, 2018). Petition Of The North American Electric Reliability Corporation for Approval of Proposed Reliability Standards CIP-013-1, CIP-005-6, and CIP-010-3 Addressing Supply Chain Cybersecurity Risk Management. September 26, 2017. Page 17. FERC NOPR Docket No. RM17-13-000 at pg. 28.